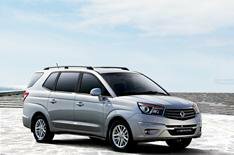 New Ssangyong Rodius unveiled | What Car? The new Ssangyong Rodius is on display at the Geneva motor show. It is more conventionally styled than the previous car, but it does keep the wraparound windows at the back and the large proportions. The car's three-metre wheelbase means there's plenty of room for seven adults and their luggage. The third row of seats can be removed entirely to increase luggage capacity even further. Power comes from a 153bhp 2.0-litre diesel connected to either a six-speed manual or five-speed automatic. The Rodius comes in rear-wheel-drive form as standard, but a four-wheel-drive version will be available as an option. The Rodius gets air-conditioning, cruise control, a heated windscreen and rear parking sensors as standard. Full specifications will be revealed nearer the car's on-sale date, which is expected to be towards the end of the year. Expect the Rodius to cost from around 16,000.